BUDAPEST (AFP) — Hungarian President Janos Ader approved Monday a controversial law seen as targeting the respected Central European University founded by US billionaire George Soros, despite protests at home and abroad. The signing of the higher education legislation, the final legal hurdle before it passes into law, came after the largest street demonstration in Hungary in recent years. Tens of thousands demonstrated Sunday in Budapest against the legislation, many chanting “Don’t sign it, Janos!” and holding up placards reading “Veto!”. Last month the Hungarian parliament re-elected Ader, a close ally of hardline eurosceptic Prime Minister Viktor Orban, for a second term as president, a largely ceremonial role in Hungary. 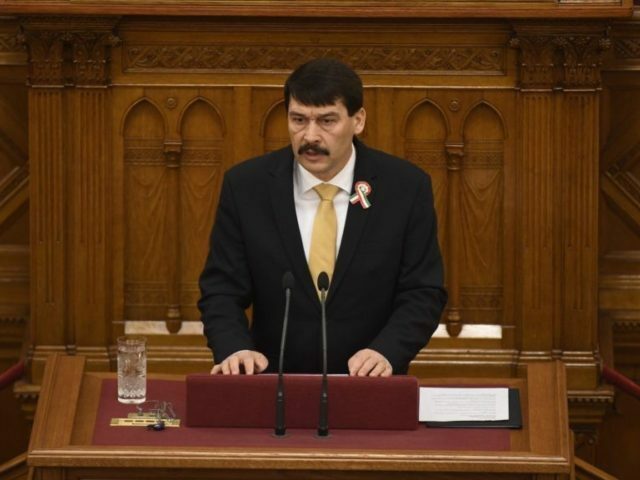 The bill, a modification of legislation from 2011, “does not infringe (rights of) freedom of learning or of teaching” enshrined in Hungary’s constitution, Ader said in a statement published by state news agency MTI. The English-language CEU was founded by Hungarian-born billionaire George Soros in the early 1990s, aimed at helping the region’s transition from communism to democracy. The new rules, approved by MPs last Tuesday, bar institutions based outside the European Union from awarding Hungarian diplomas without an agreement between national governments. They will also be required to have a campus and faculties in their home country — conditions not met by the CEU, which is registered in the United States. The legislation has been condemned by many academics at home and abroad, and has also drawn criticism from Washington and Brussels. The US State Department has called for the proposal to be withdrawn, while an open letter signed by over 900 academics around the world also includes 18 Nobel prize-winning economists. The legislation does not mention the CEU by name but the university sees itself as the main target and has warned it may have to close. Critics see the move as another attack by Orban on Soros, whom he accuses of seeking to meddle in politics and undermine Europe by promoting immigration into Europe through his funding og non-governmental organisations (NGOs). Last week the government published legislation that will oblige NGOs receiving above a certain amount of foreign funding to register and stamp any publication with “foreign-funded organisation”.